Someone recently sent me one of her favorite recipes and mentioned that I hope she didn’t think she was being presumptuous. I told her I love it when readers send me their top picks, and I usually cook them. Chances are, the tried-and-true recipes that have been delighting your family and friends for years will delight mine, too. The following is one such recipe! For my part, I can see why. The relish offers a subtle sweetness that balances the curry nicely. 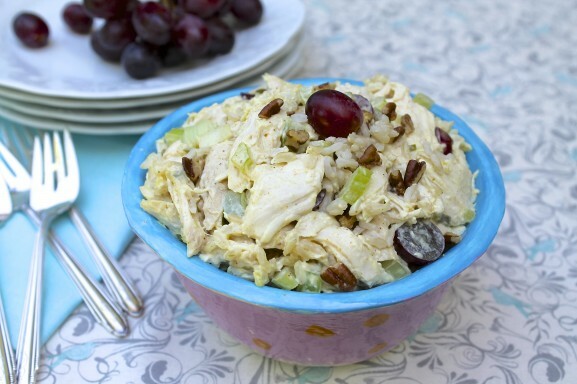 Adding rice provides extra volume and texture without being a distraction from what is, at its core, a delightful chicken salad recipe. While Dottee uses green grapes, my photo shows red, as I overlooked that part of the recipe while at the grocery store! Feel free to choose your favorite. Thank you, Dottee, for sharing your recipe! P.S. Another Fountain Avenue Kitchen friend, Cathy, just shared a quinoa salad recipe that she recently enjoyed at a corporate health fare. She asked the chef for the recipe, he kindly shared, and she was thoughtful enough to post the recipe on my kitchen Facebook page. Gently simmer chicken in water with 1/2 teaspoon of salt until tender and no longer pink in the middle. Drain and save the broth for another use. (See notes) Remove the meat from the chicken and cut into bite size pieces. Combine chicken, rice and the next 4 ingredients. In a separate bowl combine the mayonnaise, yogurt if using, curry powder, salt, and pepper. Add to the chicken mixture. Stir well. Chill. Garnish with pecans and grapes. As an alternative to poaching chicken, I often sprinkle bone-in, skin-on breasts with salt and pepper and bake in an oven preheated to 350 degrees F for 35-40 minutes. Allow to cool, then remove meat, and proceed as directed. This method yields tender, juicy chicken for use in salads or any other recipe that requires cooked chicken. The curried rice salad sounds good except the fact it mentioned to leave bone in and the skin. I can’t eat the chicken this way for 2 reason. So I was wondering what difference would it make to have boneless and skinless chicken? You could absolutely substitute boneless, skinless chicken breasts!